I’m not going to tell you this is the best granola of your life, but I will strongly lean in that direction. 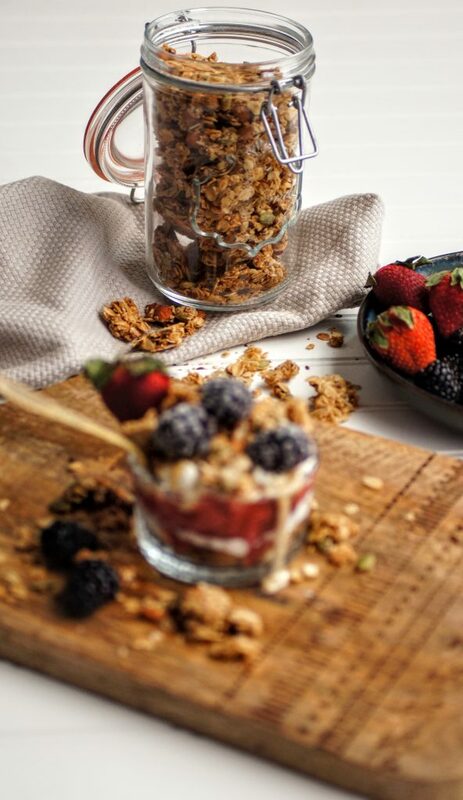 If you are one that loves GIANT clumps of absolutely delicious granola then this recipe is for you. I have struggled finding the perfect granola over the years and have tried many, many, many recipes that left me with crumbly granola. I mean, that’s all fine and dandy but I’m in it for the large clumps, the crunchy texture and amazing sweetness. 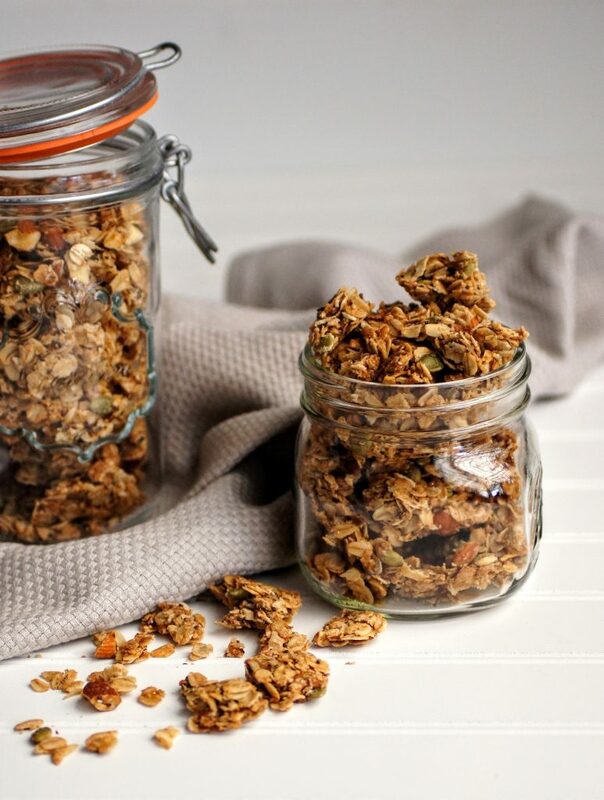 The key ingredient to take this from granola to spectacular granola is flour! Now, I know many of you are gluten free but I can assure you that using either almond flour or a flour with a 1:1 ratio, such as Bob’s Red Mill would work great! There is something about the flour that glues those tiny pieces together perfectly. It’s a special magic trick to make all your granola dreams come true. The other beauty of granola is it’s secret properties. In some ways, granola reminds me of leftover transformation night. You know, the nights you take the leftovers from your fridge and transform the same food into something new and magical. Something your kids will love and feel like it’s a brand new meal. Kind of deceptive, kind of brilliant, clearly a mom thought of this genius idea. Now, granola has some of those same properties. 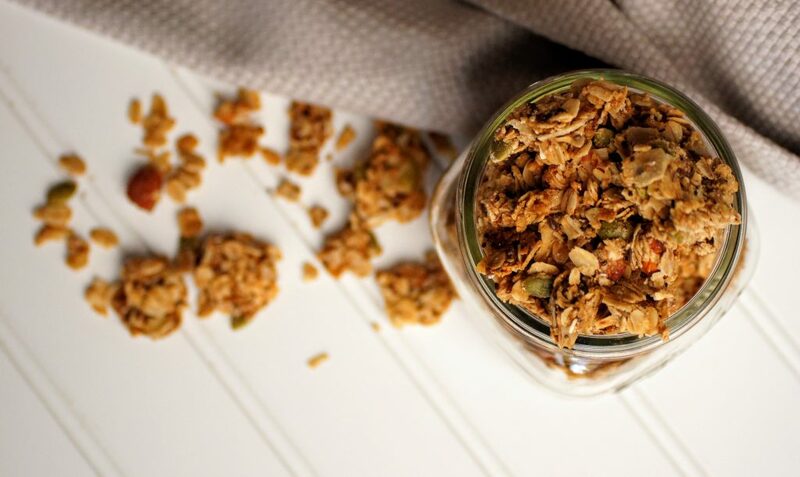 Granola is the catch all for all the goodies you want your kiddos to eat but generally won’t. So why not throw in that flax seed, chia seed, bran or whatever else you want. That’s exactly what I do! It’s an open canvas for whatever you want. My favorite way to enjoy this granola is straight out of the jar (or the pan, seriously addictive!) 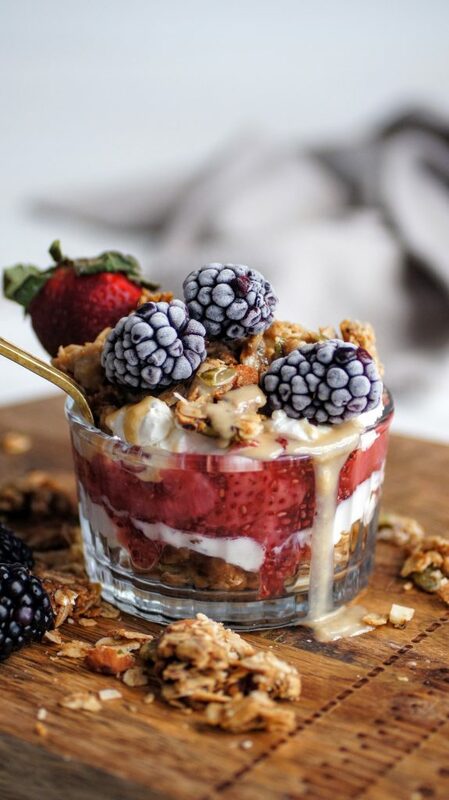 but it’s the perfect topping for yogurt or just to mix with some delicious fruit or smoothie bowl. Some almond milk and a bowl of granola is a delicious and healthy snack. Whatever way you try this recipe and whatever add-ins you try out, I hope you enjoy. Preheat the oven to 250 degrees F. Line 2 baking sheets with parchment paper or silicone mats. In a large bowl, combine the oats, nuts, flour, brown sugar, salt, chia, flax, coconut and cardamom (or cinnamon). In another bowl, combine the oil, honey and maple syrup. Add the wet ingredients to the dry ingredients, and stir until the dry ingredients are completely moistened. **Trick, melt your coconut oil first, pour then add in your honey and maple syrup the same measuring cup, they will slide right out! Spread the combined mixture in the prepared lined baking sheets. Spread out evenly and press down in an even layer. Bake for 30 minutes, switch the trays around in oven and bake another 30 minutes (do not stir). Turn oven off but leave trays in until oven cools. Once cool, remove granola trays and break apart. You will have nice big chunks! Store in sealed containers, can freeze or refrigerate for longer storage. 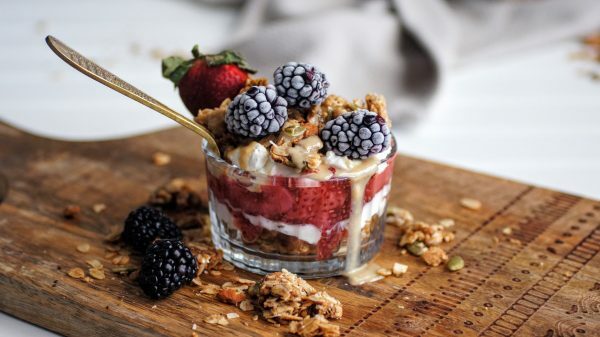 *If you like dried fruit in your granola, add in after your have broken apart and mix in container, baking the dried fruit will only make it tough. *I used chopped almonds as well as pepitas in this batch, feel free to use whatever you have on hand. Anything you suggest if we wanted to skip the brown sugar? More honey? I could use Maple sugar but that’s a lot and it’s expensive. Thoughts? Hey girl! Yes, up your honey & maple syrup to 1/2 cup each. That should do it! !♥️ Let me know how it turns out for you. Can’t wait to make it. YUM!